Just before 2 p.m. on a Tuesday, Andy McCandless is catching her breath after installing a dishwasher in her home. She's got other chores piling up, but she doesn't miss a beat and delves into conversation about the most important fundraising month for Michelle's Love. October is key for the nonprofit organization she established in 2011 to provide help to single parents diagnosed with cancer. Michelle's Love was started in tribute to her best friend, Michelle Singleton, who died of cancer in 2005, leaving behind four children. For the past seven years, McCandless has been making small miracles happen for moms who are often juggling housing payments, child care, and bills, while trying to maintain a steady life for themselves as they undergo cancer treatment. Michelle's Love helps out in real, practical ways. The organization connects with single parents battling cancer, then utilizes grants and fundraising to help its partner parents by paying their rent or mortgage, buying them gas for a month, and paying their utility bills if needed, so they can focus on their own wellbeing and spend time with family without financial barriers. In addition, the organization deploys a team of volunteers to clean the homes of its partner parents — something unconventional that McCandless takes pride in. mom in Columbia County to help. McCandless is the only paid employee of Michelle's Love, and she is solely responsible for the administration and coordination of fundraising. She takes a $1,200 monthly salary, which she says is largely covered by an annual operating grant. To help make ends meet for her own family, McCandless picked up a part-time job at Scappoose Bagel. Each Thursday in October, she and her co-worker, Mary Rotter, will be donating all of their tips to Michelle's Love. To sweeten the deal and give a boost to the nonprofit, McCandless teamed up with local business owners who have each agreed to match the tips. "It's not going to be a huge money maker," McCandless acknowledges, "but it's good exposure." Candice Fuller of Keller Williams Real Estate; Matt McHugh of Cascadia Home Loans; Timmy and Briana Rotter of Scappoose Fitness Connection; Karyn Miltich of Scappoose Outfitters; Jeff Schultz of Schultz Financial Services; Christi Schmidt from Farmers Insurance; Nick Hurliman of Hurliman CPA and Michael and Lyndsey Clarke from the Clarke Griffin law firm have each signed on to match tips for a designated Thursday in October. Partnering with businesses has been vital to the nonprofit's mission. The organization gets help big and small from business owners who aren't wooed by glossy brochures or t-shirts, but rather, the story of single moms and dads who are trying to cherish time with their children while facing the unspoken uncertainty of their own lives. "I believe people can hear our story and just want to give based on our story," McCandless says, noting most of her supporters are people who are touched by the mission of Michelle's Love and want to make a concrete difference in the lives of others in their community. "Last year we raised $120,000 and I didn't print one brochure or business card," she notes. "If everyone who has a job donated $10 a month for a year, we could change the world!" 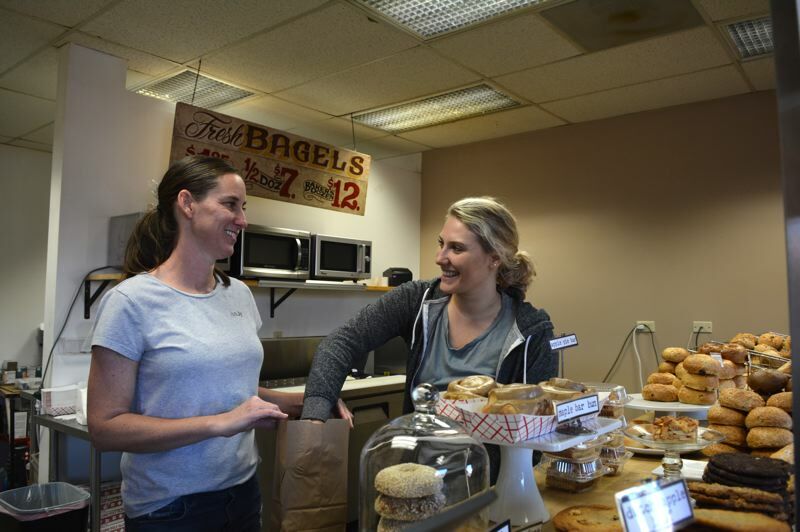 To help Michelle's Love meet its fundraising goal in October, donors can leave a tip at Scappoose Bagel any Thursday throughout the month, or visit Michelle's Love to make an online donation.